Virginia is known for its unpredictable climatic conditions. As a resident of Manassas, you have probably enjoyed several sunny days and weathered many a storm. While you are safe, secure and dry in the shelter of your home, the roof over your head faces the brunt of nature’s fury. The frequent changes in weather conditions lead to a gradual wear on the roof. Therefore, roof repair should literally be at the top of the list of essential home repairs, to keep your house, and the roof with it, in top shape. Numerous climatic factors contribute to the gradual and often invisible wear on a house’s roof. Knowing about these factors will assist you in making timely repair choices. • The sun causes damage. Prolonged exposure to the sun and ultraviolet rays cause gradual damage to the roof. Shingle roofs, especially, deteriorate when exposed regularly to ultraviolet rays. • Exposure to the wind causes deterioration. Exposure to forceful winds can cause widespread damage. Very high winds may lift the edges of roofing materials, allowing water and debris to get inside. To properly fix all blown off shingles in Manassas all the damaged felt paper and shingles must be replaced and nailed into position with polyurethane applied underneath the shingles to prevent the shingles from becoming loose. • Rain can cause the wood to rot. Rain water, if it finds its way under roofing materials or shingles, can seep into the roof deck, permitting rot to set in. The rot may spread to other parts of your home, such as the ceilings, walls following the path of the leak. • Beware of ice dams. As the snow melts, it tends to refreeze at the roof's overhang. These obstructions can devastate the gutters and may cause water to seep into your house and additional snow melt backs up under the shingles. • Hail can devastate the roof. Roofs are frequently hard-hit in hailstorms. A damaged roof may allow water in where the protective granules are knocked off, causing further damage to the deck. 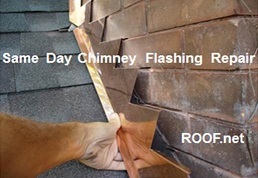 To prevent roof leaks always have the chimney flashing inspected for cracks, loose mortar joints and damaged shingles. Having to buy a new roof is an expensive venture that can be easily avoided by taking good care of what’s already there. A damaged ridge vent can leak. Missing, curled or torn shingles, cracked or damaged flashing can cause leaks, too. Blocked gutter systems can cause water to overflow, forming pools around the foundation. A chimney damaged by exposure to the elements and condensation on the plumbing systems can both be safety hazards. Water may enter your home by way of holes in your skylights or roof, if not maintained properly. You can easily avoid all this trouble by asking a licensed roofing contractor to have a look at your roof at least once a year. This is a sure-fire way of avoiding costly repairs later. • Water seeping in through the roof will damage the attic, and when it gets through the attic, will damage the ceiling. • A leak can damage the paint on the walls, and may harm electrical fixtures, such as fans and lights. • A leaking roof promotes mildew and mold growth. This can spread all over the home, including carpets and even furniture. • In the long run, rot and mold will spread to other areas of your home, weakening the structural integrity. • Black mold is often caused by constant water invasion. Mold is tricky to get rid of, and is toxic to breathe. Never ignore a Manassas roof leak repair, it will cost more money to fix the longer you wait due to structural damage and mold remediation. A high utility bill is often caused by a leaking roof, because wet insulation loses R-value. Your roof will inevitably sustain damage over a period of time. If you fix it as it happens, you gain to save on expensive repairs later on. Given the varied climatic conditions in Manassas, being proactive will also help prevent a premature roof replacement.